. Christmas shaped cookie cutters. 2. Preheat oven to 375F or 190C. Divide the dough in half. Roll each half on a lightly floured surface. Don’t make it too thick or too thin. Cut into assorted shapes with a cookie cutter. 3. 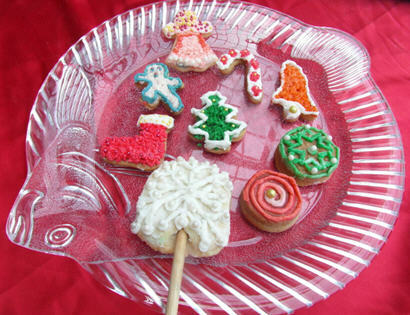 If they are to be hung as decorations, make a hole in each cookie with the end of a plastic straw. 4. Place on a greased baking tray and bake for 7-8 minutes or till light brown. Once cool, remove from the tray. 5. In a medium bowl, beat all frosting ingredients smooth. Tint with food color and decorate.